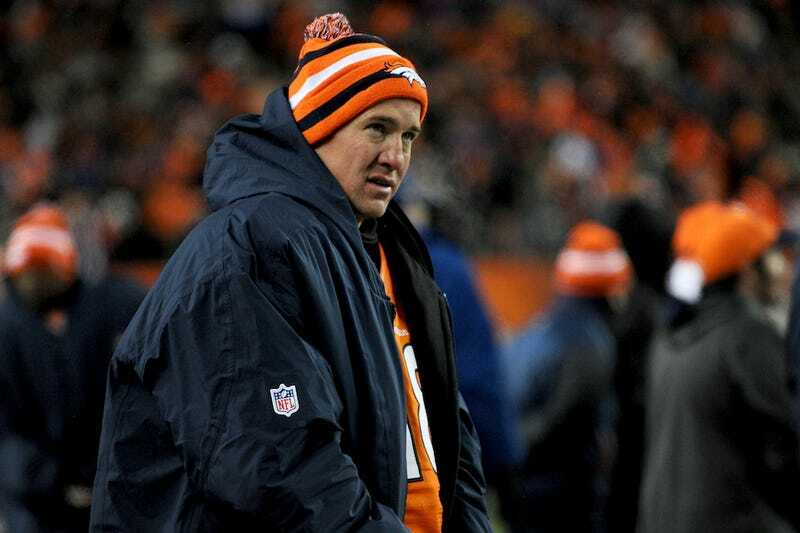 Peyton Manning lost what wound up being one of the greatest football games ever last night. He did so in his first year as the Broncos starting quarterback and just about one year after Tim Tebow pulled off an overtime stunner. So we've come to this: "Tebow has won more playoff games in Denver than Peyton Manning." A stinging, if not completely useless sound byte. One that requires ignoring for a moment that before he even took the field yesterday, Peyton Manning took the Broncos just as far into the playoffs as Tim Tebow did last year. Or that the only reason these two are somehow being compared is because with 35 seconds remaining in the game, the usually-stout Denver defense failed spectacularly at the only thing it had to do: prevent the Ravens receivers from getting behind them. Manning's Broncos were 13-3 and the top seed in the AFC. Tebow's Broncos were not even Tebow's Broncos until Kyle Orton—who would go on to battle injuries and Tyler Palko for Kansas City's starting job that year—pushed the Broncos into nothing to lose territory. And yet: Tebow 1, Manning 0. These are the choices one has when making the decision to give any kind of credence to the "wins as Broncos quarterback" note. That tweet from Mehta, presumably meant to pile on and cause some trouble, actually does all the work for you. Look at it and ask yourself if you truly believe there is anything to that statement other than "man, sports are sometimes crazy." How could it mean anything else? Only Brett Favre has thrown for more touchdowns than Peyton Manning. Only Marino and Favre have thrown for more yards. Only Favre has more completions. Tim Tebow just got rejected by the Jacksonville Jaguars and couldn't break into a lineup helmed by a guy who invented new and embarrassing ways of turning the ball over. These things need to be said not to take shots at Tim Tebow, but because it seems that we have been consumed by the craziness of the playoffs to the point where we are favorably comparing Tim Tebow to Peyton Manning. Manning had 290 yards, three touchdowns and two interceptions yesterday. One interception was returned for a touchdown. It was a bad game for Peyton and he is going to be remembered for it because as we often do, we remember the things that stand out, the outliers. A rejuvenated Tebow connected with Demaryius Thomas on an electrifying 80-yard touchdown pass on the first play of overtime and the Broncos defeated the stunned Pittsburgh Steelers 29-23 in the AFC wild-card game on Sunday. Thomas hauled in a high play-action pass at the Denver 38, stiff-armed Ike Taylor and then outraced backup safety Ryan Mundy to the end zone. 10 yards and some loft are really all that separate yesterday from last year, but try to remember that light years separate the quarterbacks.